Run for the animals this spring by participating in the TORW Scotiabank Charity Challenge!! 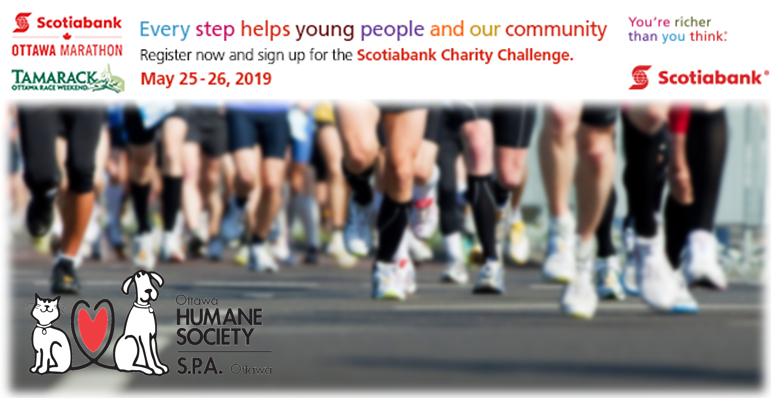 To register for your race and the Scotiabank Charity Challenge click here by following each step, you will enroll in both the race and fundraising program. Don’t forget to choose the Ottawa humane society as your charity of choice! An email with link to access your personal OHS fundraising page. Customize your personalized OHS fundraising page. Add some photos and share your story to appeal to your friends, family and colleagues. 100% of the funds raised through your page help Ottawa’s animals in need. Not a runner? No Problem!